When we think about Christmas it is almost impossible to ignore that picture that comes to mind of a big table full of food and surrounded by our relatives. Christmas may be losing its religious nature to some people but it will never lose its familiar touch, the ending of the year is still a date to be with your family in most parts of the world. So what can someone get by not travelling back home for the holidays and staying in a city like Dublin instead? I am listing below 5 things that helped me to get through Christmas in Dublin without getting sad about not being with my family. 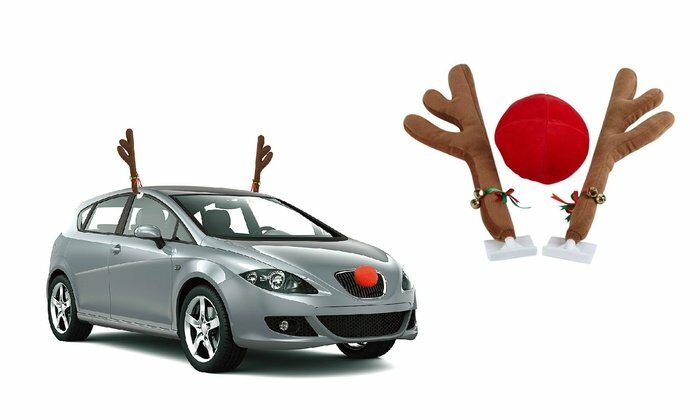 Number 1: The 3 accessories that can transform your car into Santa’s favourite reindeer. As the holidays approach, there is something very curious that starts to be seen on the Irish roads, the image of cars dressed with a 3-piece reindeer set can bring a smile to everyone’s face. This definitely started putting me in the mood for Christmas from early December and I sure wish we could have the same tradition in Brazil. Number 2: The cold weather! Christmas coincides with the winter in the Northern Hemisphere, thus hearing people on the streets of Ireland wishing for a “white Christmas” is not difficult. I have always been used to having high temperatures in December, which means that having a cold Christmas was definitely something new and also enjoyable. The Holiday was definitely the coziest one I have ever had. Different musicians take to Grafton Street in Dublin throughout the year and you can also find them there during the holidays. The music makes you appreciate every minute spent in Dublin but there is also something else that you can appreciate if you visit the famous street during Christmas eve. Every year, famous musicians meet in the street for an hour of busking. Last year’s session counted with the presence of Glen Hansard, Gavin James, The Coronas and Damian Rice. There is nothing to better put you in the mood for Christmas than a visit to see the Christmas decorations. And Dublin surely is beautiful during Christmas time. That is why I decided to share some of the pictures I took on the 24th of December. Getting to meet different people is one of the best things about studying abroad. Your international friends come from other cultures and therefore have a lot to share and to teach you. They surely can make sure you have the best of times. I decided to dedicate these last words of this post to my old and new friends. Being surrounded by loving people (family or friends) is the best present Santa can bring to anyone, and for that I am grateful =).